LYNN, Mass. 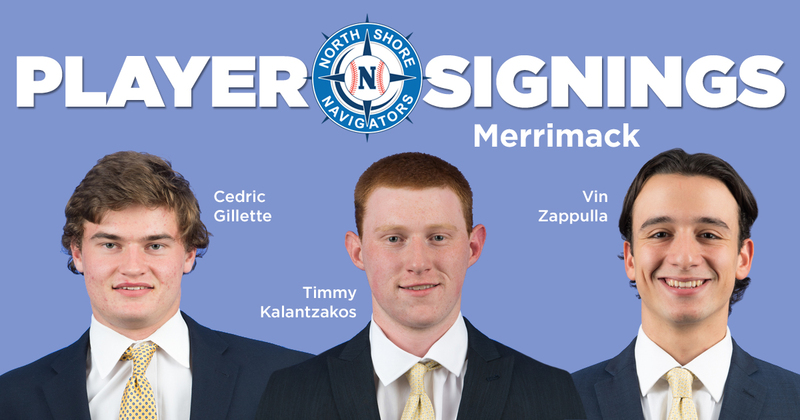 -- The North Shore Navigators added three Merrimack College pitchers to their 2019 roster on Thursday. Andover natives Cedric Gillette and Timmy Kalantzakos will join Warrior teammate Vin Zappulla on the Futures Collegiate Baseball League club this summer. Gillette, a 6-foot-1, 185-pound righty, joins the Warriors this spring after captaining the baseball, football, and basketball teams during a standout career at Andover High School. He pitched five complete games and logged 58 strikeouts in 61 innings for the Golden Warriors last spring, earning All-Star honors from the Eagle-Tribune just as he did in football. Gillette was the male recipient of the paper’s Max Bishop Award, which is given to the area’s top three-sport athletes. Zappulla earned NE10 All-Rookie Team honors after going 4-4 with a 4.80 ERA in 2018, but two of the Staten Island, N.Y., native’s three complete games came against Southern New Hampshire and New Haven teams that finished the season in the NCAA East Regional field. The 6-foot-1, 175-pounder struck out 44 batters in 54.1 innings last year, which ranks second among Merrimack’s returning pitchers. As far as Merrimack’s connections to the Navs, Ricky Smith finished out his college career as a two-year captain after catching for North Shore in 2015, while former manager Jon Cahill was one of the Warriors’ assistant coaches. This year’s Merrimack roster also includes left-handed pitcher Sean Thompson who appeared in six games for the Navs last summer after graduating from Central Catholic.